Under fire, the deputy attorney general has invoked a Martin Luther quote to say he stands by his actions. WASHINGTON — Deputy Attorney General Rod Rosenstein has struck a stoic and righteous tone in private conversations he has had this week about the fate of his job as President Donald Trump has launched public criticism against him and considered firing him, according to three sources who have spoken to Rosenstein. Those same sources spoke to Rosenstein multiple times over the course of his tenure as the No. 2 attorney at the Justice Department and say Rosenstein now seems less anxious than he has been at previous times when the president has criticized him. 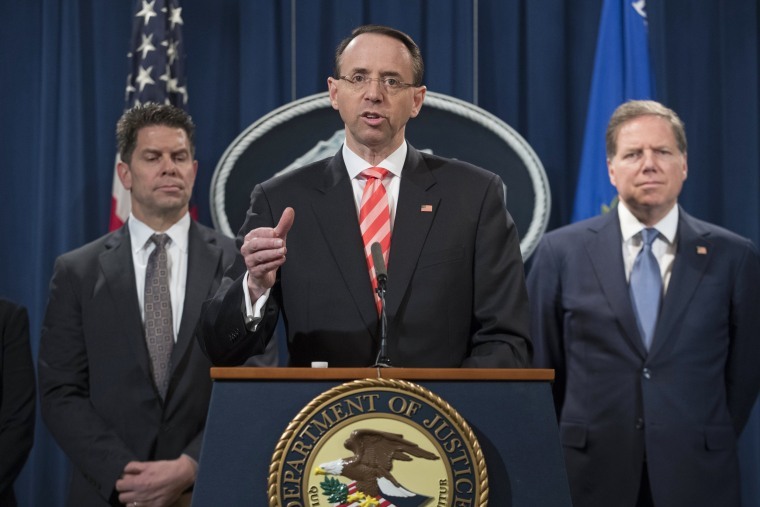 They previously described Rosenstein as anxious and upset under the pressure of public criticism for his role in the firing of former FBI Director James Comey as well as the president's wrath for his subsequent decision to appoint a special counsel to investigate possible collusion between the Trump campaign and Russia. Particularly in early summer 2017, around the time he fired Comey, and towards the end of the year as Trump increased his public denunciations of Rosenstein, sources say they witnessed the deputy attorney general's anxiety flare, sometimes in late-night phone calls. Rosenstein, who served under both Republican and Democratic presidents as a U.S. attorney, took over the Russia probe after Attorney General Jeff Sessions recused himself in March 2017 after reports surfaced about Sessions' interactions with the Russian ambassador to the U.S. during the 2016 presidential campaign. Sessions said he recused himself in order to avoid the appearance of conflict since he worked as a campaign surrogate, but that the meetings were within the scope of his duties as a U.S. senator at the time. If Rosenstein is fired, the next in line to oversee Mueller's probe is Solicitor General Noel Francisco, though Trump could choose to replace Rosenstein with anyone who has been confirmed by the Senate. Trump tweeted on Wednesday morning that Rosenstein was perhaps more conflicted than Mueller because he "signed FISA and Comey letter," referring to the authorization for surveillance of former Trump campaign operative Carter Page as well as the memo that fired James Comey. Alan Dershowitz, a criminal defense lawyer who has publically defended Donald Trump against the Mueller probe, said Rosenstein should be recused from overseeing the Russia investigation because he is a witness to issues under investigation, such as the firing of Comey. Trump's former chief strategist Steve Bannon has also called on Trump to fire Rosenstein this week. The Justice Department and Rosenstein declined to comment on the content of these private conversations. The level of concern about Rosenstein's fate is so significant that, within the past 24 hours, a group of more than 100 former Department of Justice career officials organized a statement telling Congress to be ready to take action. The officials, who've served under both Republicans and Democrats, include former U.S. attorneys John McKay of Washington and Kevin Techau of Iowa. "Many of us served with Robert Mueller and Rod Rosenstein," says the statement, obtained by NBC News. "We know the people who serve at the Department will bravely weather these attacks and continue to uphold their oaths by doing only what the law dictates," it says. "But it is up to the rest of us, and especially our elected representatives, to come to their defense and oppose any attempt by the President or others to improperly interfere in the Department's work, including by firing either Mr. Mueller, Mr. Rosenstein or other Department leadership or officials for the purpose of interfering in their investigations," the officials say. "Should the President take such a step, we call on Congress to swiftly and forcefully respond to protect the founding principles of our Republic and the rule of law," the letter says.